It was busy, very busy. I didn't need to walk, I was carried by the crowds. Every coffee shop was heaving. Can you tell refreshments were at the top of my agenda? 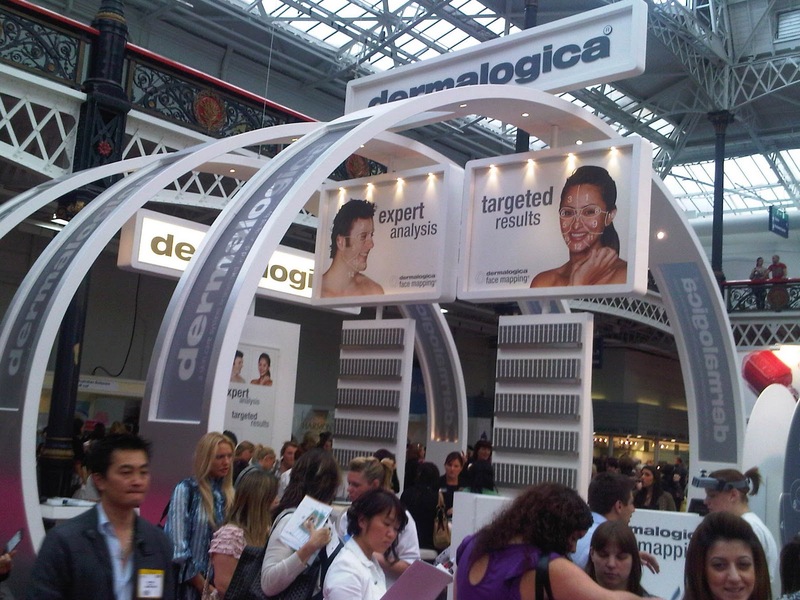 I think the show, as it is a trade show, is aimed very much at the beauticians and therapists in the industry. Nails featured heavily, whether it was colour or technique. Equipment, treatments and tanning were well represented and make-up artists were catered for. 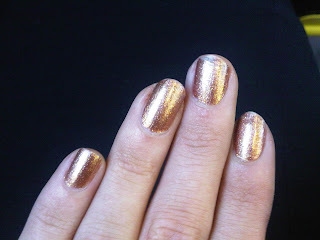 So, plenty for the professional and perhaps less so for the beauty blogger but no matter it was an experience. So what was there for me? I noticed that the newer brands that are launching are using buzz words such as natural and organic. Not a bad thing in my opinion. I definitely think that this is shaping the industry now. Consumers are seeking out natural products more and more. Well, I politely declined offers of spray tans and the ladies with their huge brushes to give me the ultimate glow and found my way to the OPI stand where I picked up two nail polishes - Dulce Du Leche - a gorgeous neutral colour for winter for the bargain price of £5.50 and one of their Designer ranges - Glow - again at a bargain price of £8.50! 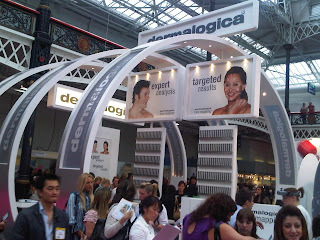 I left the Dermalogica stand till last and waited patiently in the queue for the free face mapping service. What is face mapping ? Once this is done, they have a prescription sheet recommending what products you should use, again the idea being that you only use what your skin needs. Now I have never had this done (they do recommend it as they promote themselves as a prescriptive brand) but I have used the odd Dermalogica product, in fact my favourite mask is the one from their youth range - Clean Start - Ready, Set, Scrub. 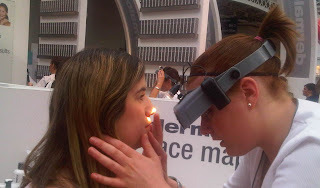 I was interested therefore to see what happens during this process and what they made of my skin. It was explained to me that usually they would spend 20 minutes or so in a Salon doing this but this was a 5 minute one special for the show. Obviously it wasn't as in depth. I was told I had really good skin - I think it is generally good, the odd break out but nothing overly concerning. I look after my skin, cleanse, tone and moisturise twice a day. I use a scrub/exfoliator twice a week and drink plenty and (usually) eat quite well. My hydration was good and the only major concern was my oily/shine t zone. Pretty much spot on I would say. Although if I was picky I would say that I am starting to be concerned about the fine lines around my eyes but have taken steps to rectify that. I will try these out and let you know how I get on with them in a later post. Did you go to the show? What did you think? Do you use any of these products, I would be interested to hear your views on them. It sounds like you had a good day, the test on the skin sounds great, i would love to have my skin tested, do you know where I could have it done? and how much it would be? Aurelia - Face mapping is free - you can have it done at a local salon that sells Dermalogica - you can check the Dermalogica website for your local salon/spa.